"I actively sought to leverage my contacts with the professor to host this meeting. The campaign was fully aware of what I was doing," he said. George Papadopoulos, a one-time Trump campaign adviser who was sentenced on Friday to 14 days in jail as part of special counsel Robert Mueller's Russia investigation, said Sunday that Attorney General Jeff Sessions was “quite enthusiastic” about his potentially setting up a meeting between Trump and Russian President Vladimir Putin. He added that members of the campaign were “fully aware” of his efforts. Papadopoulos’ remarks directly contradicts what Sessions told Congress under oath, that he “pushed back” on the potential meeting. "My recollection differs from Jeff Sessions',” Papadopoulos said on ABC’s “This Week” Sunday morning. Papadopoulos was then asked if he believes Mueller’s investigation will show there was collusion between Trump’s presidential campaign and the Russians. “All I can say is that my testimony might have helped move something towards that, but I have no idea,” he said. Papadopoulos said he brought up the idea of setting up a meeting between Trump and Putin at a campaign meeting on March 31, 2016, and that there were mixed reactions. “Candidate Trump at the time, he nodded at me, I don’t think he was committed either way. He was open to the idea and he deferred of course to then senior Sen. Jeff Sessions, who I remember being quite enthusiastic about hosting,” Papadopoulos said Sunday. He added that after the March meeting, others in the campaign were aware of his efforts pursuing a Trump-Putin meeting, including then-campaign manager Corey Lewandowski and senior aide Sam Clovis. He said Clovis had told him “excellent work” while he was discussing with the group that he was talking with Maltese Professor Joseph Mifsud, who could potentially organize a meeting with Putin. 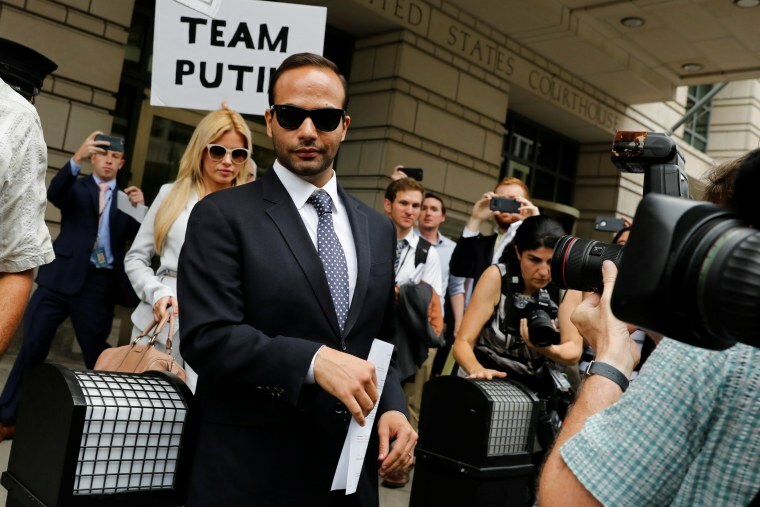 Papadopoulos was sentenced on Friday to the jail time and one year of supervised release for lying to the FBI about his interactions with Mifsud. Mifsud told Papadopoulos that the Russians possessed incriminating information about Hillary Clinton in the form of "thousands of emails" — before it was widely and publicly known that Russia had stolen Democratic emails, according to Papadopoulos and prosecutors. He later related talk of the emails to an Australian diplomat during what The New York Times described as a night of heavy drinking at an upscale London bar in May 2016. That diplomat, Alexander Downer, passed the information to the FBI, launching the federal government’s investigation into Russian election interference. Papadopoulos repeated Sunday that he was "remorseful" for his actions. He said he does not remember telling Downer, but that he does remember telling a different top diplomat. He also said he does not remember telling anyone in the campaign about the emails. Papadopoulos pleaded guilty last October to making a false statement to the FBI when they interviewed him in January 2017.